The Orange Red Head is tied exactly like the Yellow Red Head. 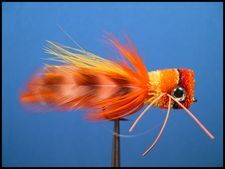 To tie the Orange Red Head use the materials listed below and follow the photo enhanced step-by-step tying instructions for the Yellow Red Head. Click Here For Tying Instructions.